A good grip is fundamental to the overall swing. 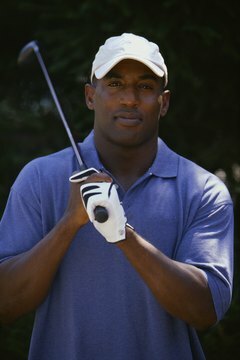 The golf grip is the very first lesson a new golfer should receive, answering the question "How do I hold this club?" The grip is the first fundamental of a sound golf swing and every other lesson stems from it. There are six basic points you should think about when placing your hands on a club. Once you have a reliable, repeatable grip, you can begin to build a good golf swing. The handle, or grip, of your golf club should lay across your left hand--right hand if you are a left-handed player--from the pad under the knuckle of your forefinger back toward the heel pad under your little finger. Close your fingers around the grip. You should be able to lift the club using only the last three fingers of your hand. Make sure you leave about an inch of shaft showing beyond your left hand. Place your right hand (left for left-handed player) over your left, either overlapping your right pinkie finger over your left forefinger or interlocking the two fingers. Interlock versus overlap is a personal choice--both options enable your hands to work seamlessly together. The "V" made by your left thumb and forefinger should be pointed toward your right shoulder when you take a proper stance. The "V" made by your right thumb and forefinger should be pointing more or less straight up at your chin. This leaves you with the feeling of having your thumbs pretty much on top of the shaft and is a fairly "neutral" grip as opposed to strong or weak. Rotating your hands to the right "strengthens" your grip and allows you to shut the club face down faster as you swing through the ball. Rotating your hands to the left "weakens" your grip allowing you to keep the club face more open through impact. The club should feel as if you are holding it more in your fingers than in the palms of your hands. This offers far more fine motor control over the club and club face than holding the club in your fists. Your grip pressure should be very light. A tight grip tenses the muscles up both arms, limiting your range of motion. A light pressure allows freedom of movement--hold the club only tight enough to keep it from slipping out of your hands.